This ultra-modern redevelopment of a building in on the right side of Barcelona’s Eixample is a new addition to my showcase of the best new developments in Spain. 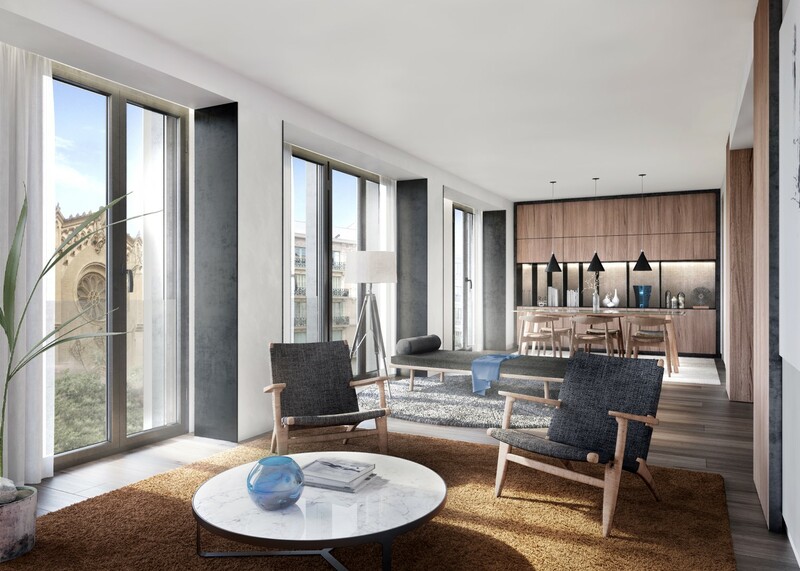 Ausiàs March 49 is a reconversion project that will turn an office building into ultra-modern apartments with a funky, contemporary style that will appeal to buyers looking for the best of modern convenience in classic surroundings with a top location. This project is unusual in offering ultra-modern new homes in an area of Barcelona better known for its period buildings. For people who want the style and comfort of high-end contemporary design and layouts in a classic setting, then Ausiàs Marc 49 ticks the box. You get the best of both worlds, living in modern comfort surrounded by classic charm, plus other benefits like private underground parking and the latest in home technology and energy efficiency. It has a great location on the right side of the Eixample – the hot place to live in Barcelona right now, in high demand with locals and foreigners alike. It is just off Passeig de Sant Joan (Paseo San Juan), one of my favourite boulevards in Barcelona, and more pleasant to live near than Passeig de Gracia I think.